The Luxury Mega Yacht Destination Fox Harb'r Too, considered the best of the best, has been updated and now available for charter in the Mediterranean, and the Caribbean for the winter. Its interior inspired by a European Spa Resort from its hand carved glass and wood work to the sophisticated fabrics. Combined with satin nickel accents and beautiful stonework, the Destination Fox Harb'r Too is a floating work of art. 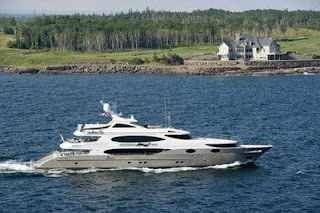 The mega yacht comfortably accommodates 11 guests in 5 luxurious staterooms. ON DECK, FORWARD, FULL BEAM OWNER’s STATEROOM: As you enter the Owner’s area, there is a private office to starboard with a queen size sleeper sofa, with private en-suite head and shower. 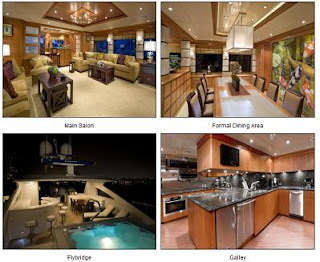 HIS EN-SUITE featuring a shower, head and sink is situated to starboard, with HER EN-SUITE featuring a Jacuzzi tub, bidet, head, sink, and shower situated directly forward. Proceeding forward, there is a grand entrance to the Master Stateroom with settee to port and a vanity to starboard. Two stairs up to port access the walk-around king bed facing forward with panoramic views. Aft to port: Spacious Stateroom with walk-around king size bed, 26” flat screen TV with DVD, individual satellite receiver, and surround sound. En-suite features head, marble countertop with sink and spacious shower. Aft to starboard: Spacious Stateroom with walk-around king size bed, 26” flat screen TV with DVD, individual satellite receiver, and surround sound. En-suite features head, marble counter top with sink and spacious shower. Forward to port: Spacious Stateroom with walk-around king size bed, 26” flat screen TV with DVD, individual satellite receiver, and surround sound. En-suite features head, marble countertop with sink and spacious shower. Forward to starboard: Twin Stateroom, with one Pullman berth, featuring 26” flat screen TV with DVD, individual satellite receiver, and surround sound. En-suite features head, marble counter top with sink and spacious shower.